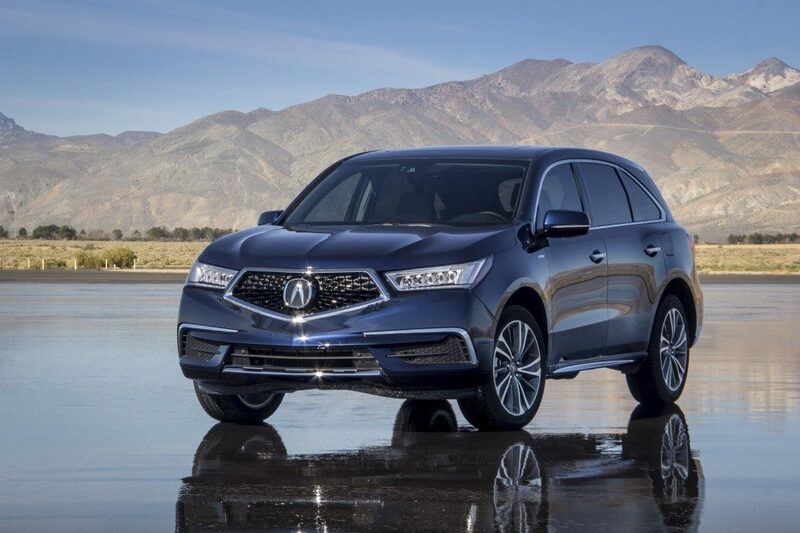 This year’s model of the MDX is a well-rounded option for families or drivers who ride with a lot of passengers and it is also reasonably priced for the features it offers. Many improvements have been made to this model in comparison to last year. The interior has room for seven passengers across three rows. The base model trim allows for a great deal for the room in the first and second rows. The second and third rows consist of bench seats. The third row can be accessed by pressing a button on the second row to tilt the seat forward to some extent. The first and second rows provide a great deal of leg room, especially since the second row can slide forward and backward. The third row, unfortunately, is a little cramped, especially when taller passengers sit in the second and first rows. Thankfully, the driver seat offers a directional, powered adjustment that moves in ten different ways. The passenger seats offer eight-way directional adjustment, too. The mild exterior design is refreshing and consists of new styles for the bumper, headlights, hood, grille, and fog lights. It also has the RLX Hybrid’s gas and electric powertrain. The fuel economy goes to 25 miles per gallon in the city and 26 on the highway. The interior trim consists of genuine wood and a heated steering wheel. It also comes equipped with AcuraWatch, which is its software suite. The MDX offers two trims in addition to the standard model: Advance Package and Entertainment Package. The price ranges between $44,050 and $58,500. The Advanced Package allows for two bucket seats in the middle row, but a combination of the Advanced Package and the Entertainment Package keeps the second row as a bench seat. Standard features include leather upholstery and accents. The extra packages change the leather to Milano leather with ventilated front seats, and even the second-row seats are heated, too. There is also a Technology Package that can be purchased for an additional $4,410. It has a dual-screen rear entertainment system and a remote engine start. The cabin is quiet and comfortable. Most of the materials inside of the cabin are of high quality, which puts this model a step above its competitors. The MDX offers lots of cargo space at 90.9 square cubic feet. It has 15.3 cubic feet behind the third row, too, meaning it can hold a lot of groceries. The MDX has one of the most powerful drive trains for similar models on the market. It uses the i-VTEC valve train with a two-stage Variable Cylinder Management. Fuel efficiency comes out of the rear when the VCM fuel injectors and valves become closed off. Because the fuel injectors and valves close off, they can be overridden, which provides more efficiency. It is rated at having 290 horsepower 267 feet of torque per pound. It also has a 9-speed version that is rather comparable to other models. Unfortunately, the car sometimes becomes confused between gears when shifting is considered. There is a hesitation with the throttle when going from primary cruising modes and into merging or transitioning stages. There are two modes available with this model: Drive and Sport. The Drive option relies on the transmission for automatic shifting. However, the Sports mode uses paddle shifters behind the steering wheel to generate quick or slow down throttle over varying road conditions such as going up and down hills. It has a strong V6 overall, and it provides plenty of power for the size of the vehicle. The power is comparable to most SUVs: it is very comfortable while being extremely agile. It has a surprisingly nice sound which is not too loud or too soft. • Air bags for . . . Considering the 2017 MDX is the first model to use a direct-inject engine, it leaves a lasting impression on drivers and passengers. It was adapted from the Acura’s durable racing engine, so it offers a great deal of easy acceleration and consistent driving at the same speed. It handles better than some other models in its class when it comes to shifting gears and lanes and going from acceleration to a set speed. The MDX offers a great warranty, too. It is covered by a four-year or 50,000-mile limited warranty, but the powertrain is covered for an additional two years and 20,000 miles. This model happens to be Acura’s best version of the MDX to date. It keeps a lot of the same features in its engine as does the Acura’s racing engines. It has some of the best ratings in its class, and the majority of all buyers who purchase this vehicle are more than satisfied – to be specific, 87 percent report positive results. It also has excellent fuel economy that can hardly be matched by any of its competitors. In short, the 2017 Acura MDX does not just aim to please: it succeeds. Thinking of buying an Acura MDX? Already own one? Leave a comment and let us know what you think!